It looks very strange that airline will return aircraft in peak period without getting replacement . It appears that E 170 from EEC has been pulled out by Lessor and not planned return from Airline . Both E 190 are due heavy check in coming month and that will leave airline with only one aircraft in Nov for considerable period . Both E 190 aircraft are expected to go JORMCO for heavy check .. It is believed that Air cost is negotiating with GECAS for E 190 and two aircraft destined for Flyeasy may go to Air Costa .. Regional Airlines are allowed to fly pan India except cat I route which are all direct route between Six metro and TRV . 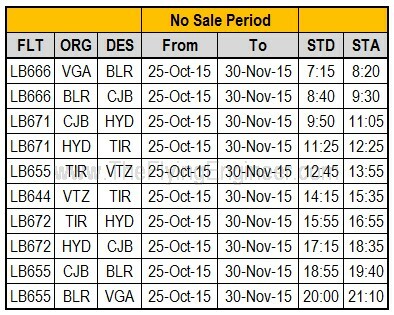 South based regional airline are allowed to operate three Southern Metro MAA-BLR-HYD . There is no restriction to connect any Metro with tire II and Tire III from any Metro .. Air costa needs not to wait to get National permit to connect tire II and tire III from any metro .unless they want to connect all Metro like main airlines .. Happy Anniversary Air Costa! Glad to see you are becoming an all E190 operator.